This cutting from a choir book shows the 'Creation of Eve', one of the most important stories of the ancient world. 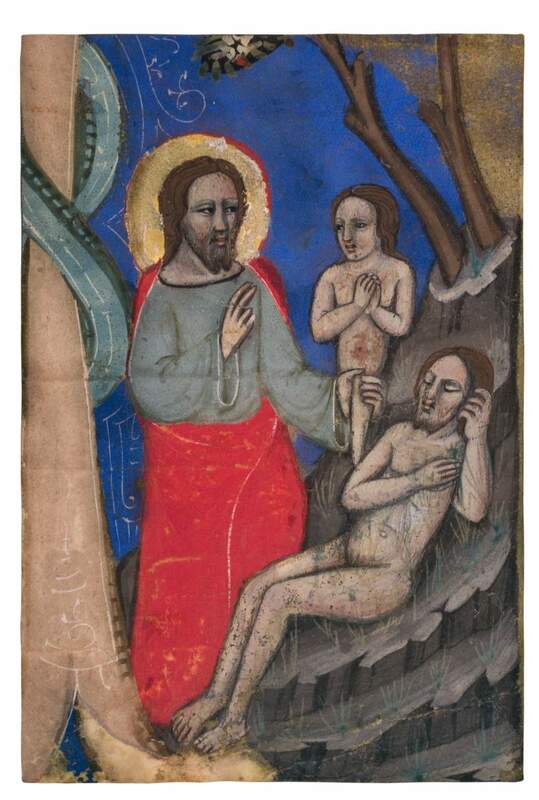 This miniature can be attributed to the close circle of Niccolò di Giacomo da Bologna who ran one of the most prolific workshops during the second half of the 14th century in Bologna. Although no text on this cutting has been preserved and while the initial I itself is only partly recognizable, the impressive Creation of Eve likely opened the chant: 'In principio Deus creavit…' The miniature comes from an Antiphonal leaf celebrating the feast of Septuagesima Sunday, the beginning of the season of Lent leading up to Easter. The readings at Matins on Sunday and during the following days are taken from the first chapters of Genesis, which recount the story of the creation of the world, the creation of Adam and Eve, and the Fall of Man. In this small but impressive creation scene, the illuminator evokes one of the most important stories of the ancient world, a tradition handed down over the centuries in art and literature. In Western history, the story of the creation of humanity follows what is written in the Hebrew Bibl. It is first briefly mentioned in Genesis 1:27 and continues in Genesis 2:21-23: Then the Lord God cast a deep sleep upon Adam: and when he was fast asleep, he took one of his ribs, and filled up flesh for it. And the Lord God built the rib which he took from Adam into a woman: and brought her to Adam. And Adam said: This now is bone of my bones, and flesh of my flesh; she shall be called woman, because she was taken out of man. This compelling Creation of Eve from Adam’s rib quite literally visualizes the text: Adam is asleep and God actually holds a bone-like structure in his hand from which Eve emerges. The illuminator painted a calm, quiet moment with somewhat stocky, voluminous figures with large, broad faces. Dressed in thick drapery, the figure of God receives extra emphasis in a more massive appearance. This miniature can be attributed to the close circle, if not the actual workshop, of Niccolò di Giacomo da Bologna (active 1349-1403), one of the most prolific illuminators in Bologna during the second half of the 14th century. In compressing the figures’ action and in the application of dark outlines and shadows, the illuminator intensified the drama of this scene. He presents the Lord, considerate and calm, and portrays Adam and Eve with dignity and beauty. As Niccolò’s work in later years became more elegant, with expressive figures and crowded, action-filled narrative scenes, we can date the present miniature quite confidently to the 1360s.